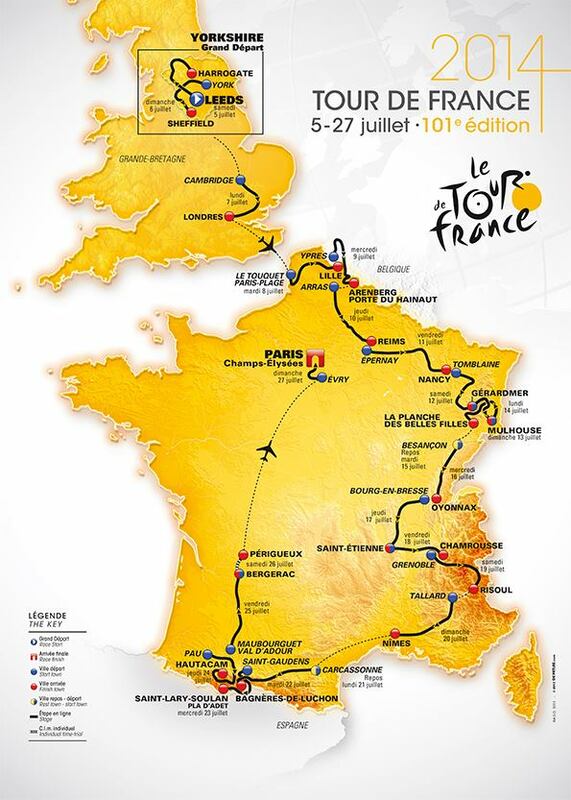 Unless you’ve been living under a rock for the last few months, every cyclist in Britain, along with most of the public, knows that the Tour de France is starting in the UK this year. 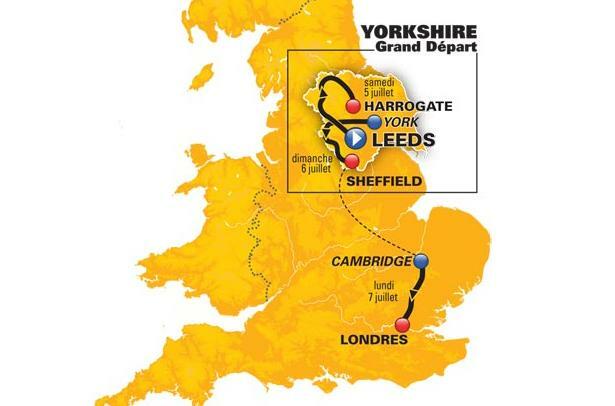 The grand depart takes place in Leeds on Saturday 5th July with two stages in Yorkshire (Stage 1, Leeds – Harrogate and stage 2, York – Sheffield) and a third in the south, Cambridge to London. Although a sprint finish is predicted on all three days, the second day from York to Sheffield is anything but flat with nine categorised climbs which may catch more than a few people out and create time gaps from the word go. The third stage from Cambridge to London is virtually flat and the finish on The Mall is pretty much a guaranteed one for the sprinters. This year’s route favours the climbers with six mountain stages, two medium mountains, two ‘undulating’ and only one time trial – a relatively long 54km rolling individual test on the penultimate day which is sure to influence the overall. The route has been designed to ensure plenty of action and intrigue right up until the end of the race with a very tough second half in the Alps and then Pyrenees in the last few days. There are plenty of opportunities to gain or lose time in the last week so expect to see the big guns keeping a low profile until then and going for it in the mountains. Apart from the three stages in the UK mentioned above, there are several other stages which look to be spectacular viewing and should have an impact on the race. Unfortunately two are mid-week stages so time to book holidays or get the excuses for work ready. Everyone has to ride the cobbles when the Tour comes to town. 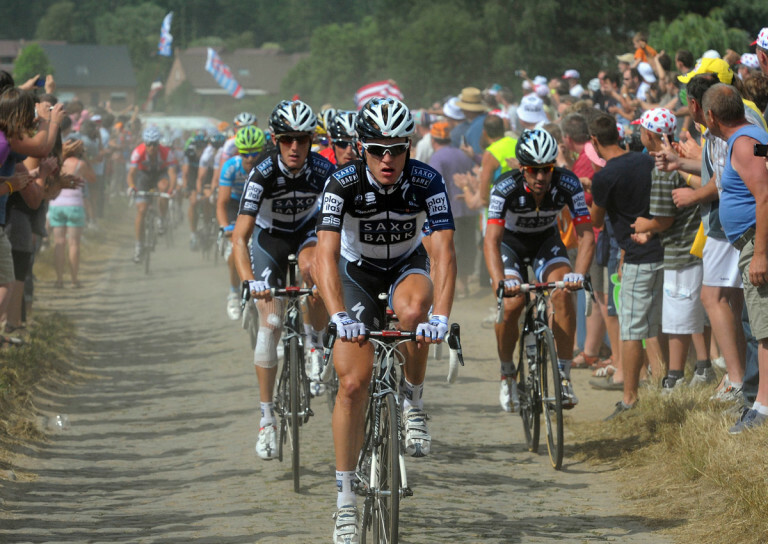 The first is just two days after the race leaves the UK when stage 5 on Wednesday 9th July takes in several cobbled sections of pave as used in Paris – Roubaix. The stage may only be 156km in length and described as flat in the guidebook but this could potentially ruin some of the overall contenders’ hopes early on. There is a mouth-watering nine sections of cobbles totalling 15.4km including the kilometre long Mons-en-Pevele ranked five stars (the hardest) in Paris- Roubaix as well as the four star Helesmes only nine kilometres from the end of the stage. Expect to see some very aggressive racing well before the pave sections as teams try to get their GC men to the front and out of danger as well as the cobble specialists fighting for position to set up a stage win. This stage won’t necessarily help anyone win the Tour but could certainly cause them to lose it. 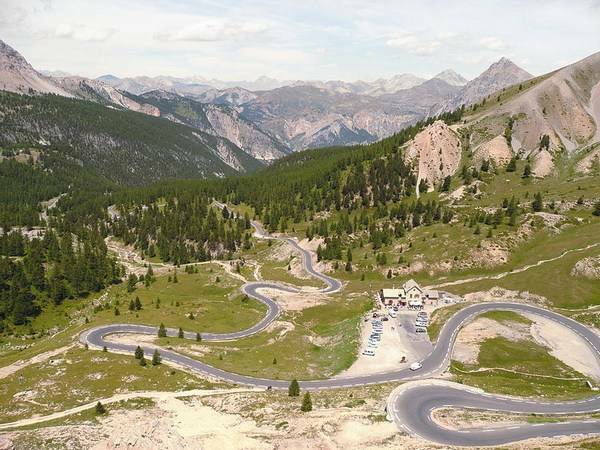 Col d’Izoard, looks like another one to add to the bucket list of climbs. This is the second day in the high mountains with three major climbs and a summit finish. The stage takes in the Col du Lautaret (2,058m) which may not be steep but since the route climbs from practically the start of the stage for 80kms to the top it’s going to be a tough day. Then the riders cross the highest point in this year’s Tour – the Col d’Izoard (2,360m) before the 13km first category climb to the finish at Risoul (1,855m). This is the second stage in the Alps and comes the day after a 198km stage with a HC (the toughest category) summit finish at Chamrousse where the overall GC contenders will already have been forced to show their cards. They may have been full of riding the day before but today’s stage promises to find any weak points which will be exploited to the full before the flat stage the following day. The peloton on the way to Hautacam. This is the last of three tough stages in the Pyrenees but more importantly the last big mountain stage in this year’s race and therefore the last chance for the climbers to gain time before the 54km individual time trial on Saturday. The road rises from the start and tops out 95kms later on the Tour’s most used climb the 17km HC climb of the Col du Tourmalet (2,115m). From here it’s downhill for 35kms before the last summit finish of this year’s Tour, the 14km HC climb to Hautacam (1,520m). This stage will keep the suspense of not just the stage but the entire Tour right until the final climb. Any rider with anything left or time to make up is going to have to do it here as there are no more climbs and only the time trial left to try and gain time and influence the overall. They’ll all be tired but they’ll all be trying so it’s going to be a good one to watch. Have a look at all our Tour De France accessories and stuff. Tagged racing, tdf, Tour De France. Bookmark the permalink.